"Severndroog Castle is a folly situated in Oxleas Wood, on Shooter's Hill in south-east London in the Royal Borough of Greenwich. It was designed by architectRichard Jupp in 1784. It was built to commemorate Commodore Sir William James who, in April 1755, attacked and destroyed the island fortress of Suvarnadurg (then rendered in English: Severndroog) of the Maratha Empire on the western coast of India, between Mumbai and Goa. James died in 1783 and the castle was built as a memorial to him by his widow, Lady James of Eltham. A Grade II* listed building, the Gothic-style castle is 63 feet (19 m) high and triangular in section, with a hexagonal turret at each corner. From its elevated position, it offers views across London, with features in seven different counties visible on a clear day." And what's more after 25 years, this Sunday it reopens to the public for the first time. 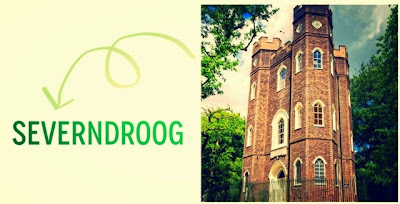 There's a whole lot of activities planned to celebrate its reopening which I shared earlier in the week - see There ain't no party like a Severndroog party! 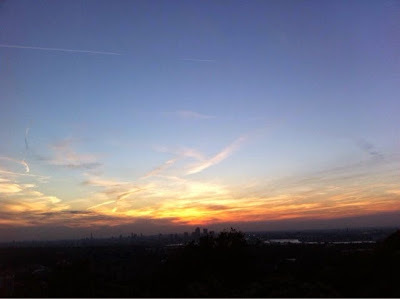 So I've had a Severndroog focused kind of week - getting posters printed, persuading local business owners to display them (which to be fair has been relatively easy), featuring in the local press and on the BBC London news (you canwatch the clip here), drinks at the castle yesterday - just look at the sunset below - and still more to do to make Sunday the success it deserves to be.